●Thermal shock resistance is measured by the water dropping method. 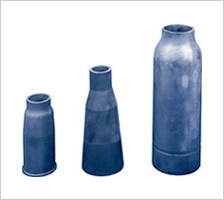 "RECRYTE firing containers, trays and Crucibles" have excellent thermal shock resistance and chemical corrosion resistance. These features as well as their thinness and light weight make these products suitable for applications such as fluorescent paint firing containers. Production is possible in various complex shapes. 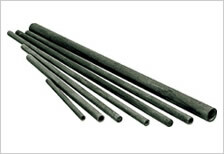 RS420, especially, has been widely used as a high-strength material. ※Please inquire about other dimensions. 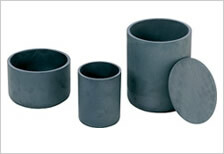 This material has gained wide acceptance for use as rollers in roller hearth furnaces used primarily for rapid heating of materials featuring outstanding high temperature strength and thermal shock resistance. It can be produced in sizes up to 60mm in diameter. 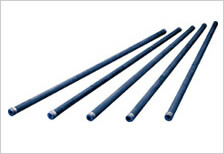 "RECRYTE protection tubes" are high density silicon carbide products. 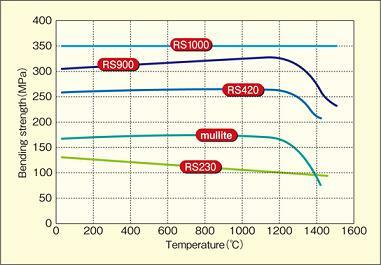 Excellent strength characteristics at high temperature. Excellent characteristics as thermal radiation bodies. Expert advice on material selection and application can be provided upon request. 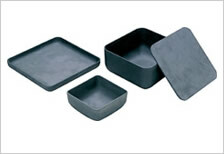 Long complex form or thin products can be manufactured to the most exacting tolerance. Applications include beams, supports, and construction materials, or setters, trays and base plates for firing of electronic parts or ceramic. 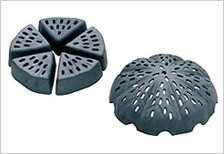 RECRYTE is a ceramic product and is subject to damage if dropped or struck against other objects. Avoid shocks when handling the product. If damaged, broken surfaces may be sharp and protective devices (gloves) should be used during disposal.